The heat is beginning to get to me...oh who am I kidding, I can't stand the heat ever. The only good thing about it is you can wear shorts, mini skirts and dresses without tights, ha ha. But I hate being hot and sweaty and gross...hurry up Fall! (but not too quickly...) It's at times like these when you just want to stay inside all day to escape the heat. I wore this yesterday to go grocery shopping and to buy some supplies for camping later this month! My best friends and I are going to Vermont for the second year in a row, but I used to go with my family every Summer when I was younger...ahh memories! those shorts are fabulous! i LOOVE the print!! 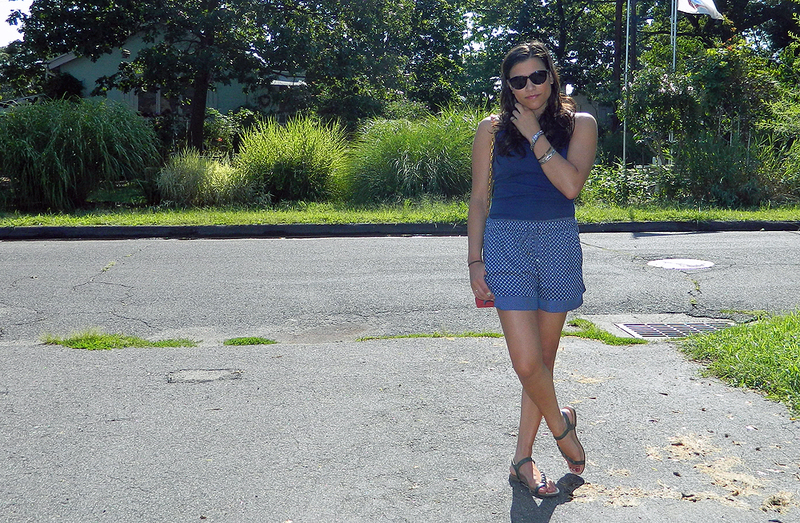 love those printed shorts and the comment, "come on fall, but not too quickly!" I feel the same way! Your shorys are fab!! Super love! Cute shorts! Camping trips are always SO fun! I'm going with a couple friends at the end of Sept. River tubing, smores and lots of laughing= the perfect weekend! those printed shorts are just the cutest, and yes, you will miss wearing them when it's cold again. love love the pj shorts. I know what you mean, the heat in Panama can be quite unbearable as well. You are looking very chic though, I LOVE your shorts! The heat is horrible! I can't stand it at times. To me, the sticky and sweaty is totally made up for by the not having to wear tights! Also, I say this every time you wear them, but I love those shorts. Pyjamas in the best possible way! I have a love/hate relationship with summer though I do prefer it to those nasty winters. Ugh. I am so happy to be away from the east coast heat and humidity...but I miss all the great camping there, have fun in Vermont! You know, I've figured that I don't mind heat so much, but what I can't stand is heat + humidity! I'm pretty ready for cooler temps! These shorts are soooo beautiful! Cute shorts! Love the print and they look comfy, too. That looks like the perfect running around doing chores in the heat kind of outfit with the simple tank and shorts. I just cannot wait until Fall comes...it's just my favorite season! !